Home Help and Advice What is the Big Garden Birdwatch? The British public really does love nature. By browsing on Instagram or looking at the TV schedule, you can see what we mean. It seems that more and more, every pixel of every screen is raising awareness or celebrating some small facet of nature. So when a big event comes around, where we can all get together online or in person, to watch and cherish all this life around us, it’s a shame to not get involved. In recent weeks you may have seen adverts for the RSPB’s annual “Big Garden Birdwatch”. But just what is it, and how do you get involved? The Big Garden Birdwatch is a yearly event run by the RSPB, and has been running for almost 40 years! It encourages people from all walks of life across the country to simply sit and relax for an hour, and watch the birds that visit their garden. By noting down the birds that visit, and the numbers too, you can really help paint a better picture of bird numbers across the UK. This can help with conservation, and form the basis for better advice on feeding, as well the use of nesting boxes too. The 2018 Big Garden Birdwatch takes place between 27-29 January. The first step is to download your pack from the RSPB website. This will give you lots of info, and a place to mark down the birds you see. Make sure you have a bird food feeder set up in a place that is both easily visible to you and the birds you’re trying to entice, then fill it with feed! To really maximise the variety of birds that visit, we recommend offering an all season seed mix; this is basically a blend of many different ingredients popular with a large spectrum of birds, from robins to wrens! Of course, as long as you offer some kind of food, you can expect to see a bird or two. Ideally, you will have set up your feeders in advance, so the local bird population know where to look; but you’ll soon be found either way. What if I don’t have a feeder or feed? Well, don’t worry! There is probably a population, albeit small, of wiggly worms and other grubs and critters that birds love in your garden, so you may still get some visitors. Only put put enough out for a single day. Leftovers can rot quickly! Crispy coatings can be hard for birds to get through, so open up any food that may be hard to penetrate. Never put out food that’s been heavily salted as it can really damage a bird’s immune system. If you aren’t sure, don’t put it out! Of course, you can get involved on social media too! Remember that it’s never too late to get involved! If you’ve left it too late or are simply too busy right now, you can still do your bit down the line. Feeding the birds is a great thing to do, and we of course encourage it as much as we can. 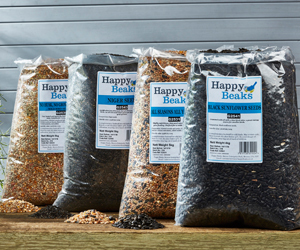 Why not check out our bird feed starter bundles and tell us what you discover? Previous articleWelcome to the Happy Beaks blog! Next articleSnap of the Month – Take a photo and win!